At just 17 years old, his work was already on display in galleries alongside that of Pop Art pioneers Keith Haring and Jean-Michel Basquiat. But while his contemporaries devoted themselves exclusively to Pop Art, Stash stayed true to the subway and continued to work on trains until 1987, pursuing train writing as his adrenaline-fuelled yet illegal purpose in life. He painted his last train in collaboration with Zephyr, one of the most important writers in graffiti history. In the late 1990s, Stash developed his ideas alongside collaboration partners from the street wear scene. His visions of graphic graffiti elements on clothing and footwear were a significant factor behind the boom in collaborations that has been evident over the last ten years. Today, Stash is renowned as an innovator in the world of urban design. 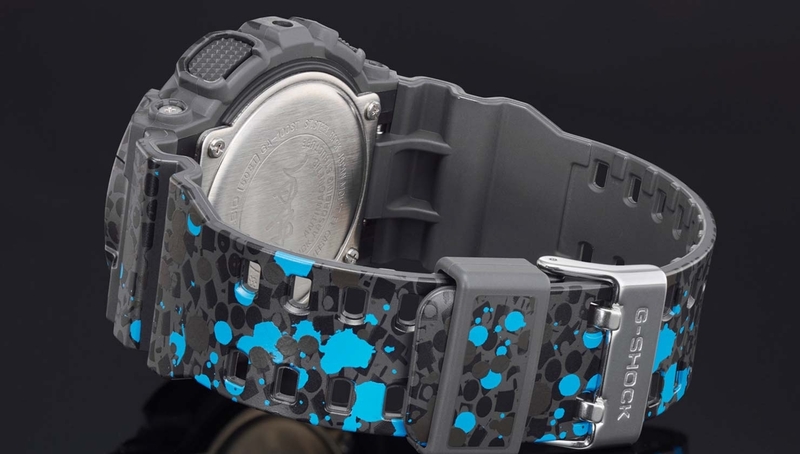 The graffiti artist is not only good with a spray can — he's also an impressive watch designer! 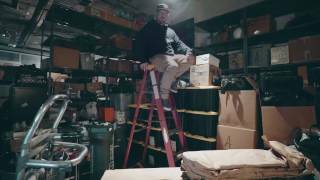 Since even the early days of his career, Stash has associated G-SHOCK with a mutual understanding of the urban world. 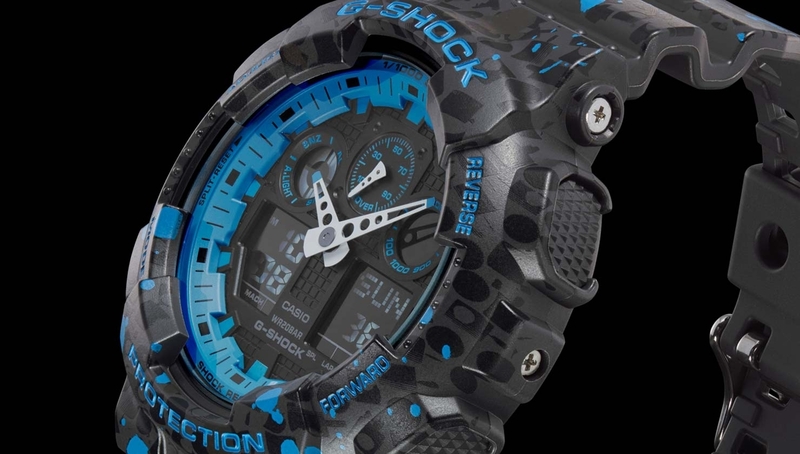 What's more, he's been an avid G-SHOCK fan since the late 1980s (as you can see in the video). Style, loud colours and toughness — the graffiti world recognised all of G-SHOCK's potential early on and was eager to embrace it. 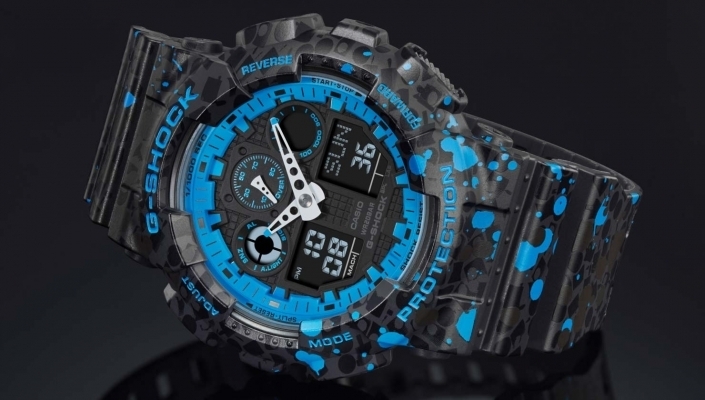 So it was more or less a foregone conclusion that Stash would design "his" G-SHOCK, giving the GA-100 a new ultra-cool, design. 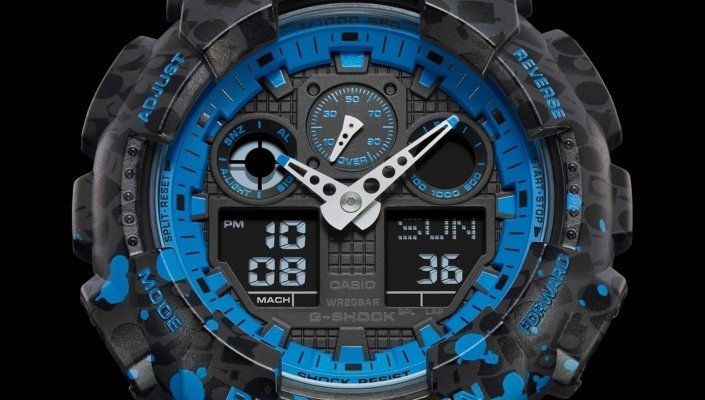 For the new GA-100ST, Stash captured two of his most famous motifs: one being the black-on-black print comprising hundreds of caps on the strap and case, and the other being the splashes of colour in his signature shade of blue. Stash's tag is engraved on the back of the case. 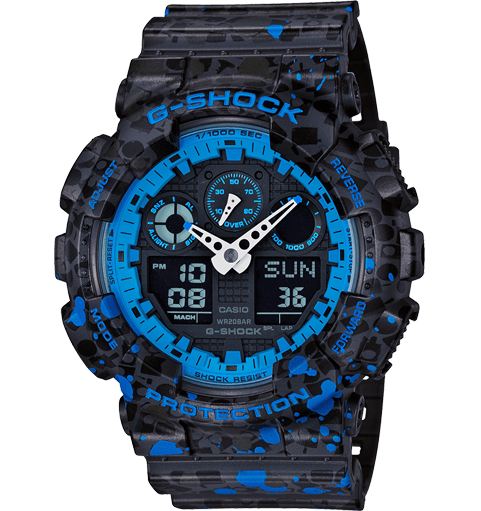 For the packaging of his first watch collaboration with G-Shock, the American artist came up with something special: in true Stash style, the limited-edition GA-100ST-2A comes in a unique spray can packaging featuring the iconic Stash logo.